Coughing up $4 fees for ATM transactions. Iron-clad cell phone contracts you can't get out of with a crowbar. Paying big bucks for insurance you don't need on a rental car or forking over $20 a day for supposedly "free" wireless internet. Every day we use banks, cell phones, and credit cards. Every day we book hotels and airline tickets. And every day we get ripped off. - You didn't fill up the rental car with gas? Gotcha! Gas costs $7 a gallon here. - Your bank balance fell to $999.99 for one day? - You miss one payment on that 18-month same-as-cash loan? Gotcha! That'll be $512 extra. - You're one day late on that electric bill? Gotcha! All your credit cards now have a 29.99% interest rate. But not for much longer. 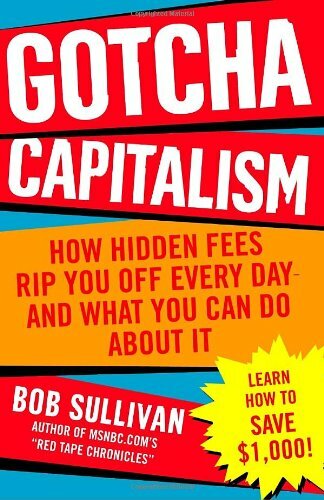 In Gotcha Capitalism, MSNBC.com's "Red Tape Chronicles" columnist Bob Sullivan exposes the ways we're all cheated by big business, and teaches us how to get our money back-proven strategies that can help you save more than $1,000 a year. Bob Sullivan is an award-winning journalist and author. With over two decades of experience, he is best known for covering computer crime and consumer affairs for MSNBC.com and running the "Red Tape Chronicles" blog. He has won the Peabody Award, the Public Service Award from the Society of Professional Journalists, and the Betty Furness Consumer Media Service Award from the Consumer Federation of America. He earned degrees in History and Mathematics from Fairfield University and a Master's degree in Journalism from the University of Missouri. He now lives in Maltby, Washington.